seekers can apply for these jobs through the CG Dept Website www.cgforest.com. Mode of Applications is online method. Last date for receipt of Application is on or before 20-05-2017 by 11:59 PM. Forest Dept of Chhattisgarh will hire candidates for this Computer Operator Pots based on the performance in skill test and Interview. 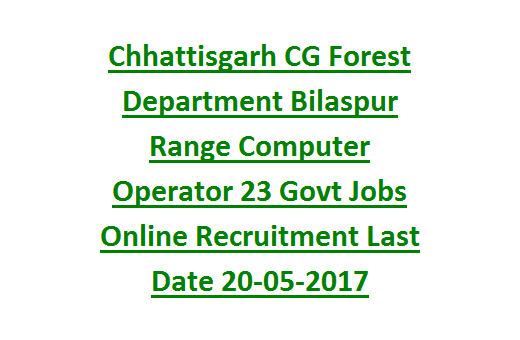 Available vacancies, Age Limits, Pay Bond, Qualifications, Selection process and other important details of Chhattisgarh Forest Department (CGFD) Bilaspur Range Computer Operators Recruitment are given below. Last Date for submission of Application online is: 20-05-2017 by 11.59 PM. Available vacancies in CG Forest Dept latest Recruitment is 23 posts. Computer Operator: 23 posts (Bilaspur Range). Candidates applying for the latest Chhattisgarh state forest department recruitment of Computer Operator Jobs they must have completed 12th / Diploma for 1 year in Data Entry Operator/ Programming from a recognized board or Institute. Typing Skill must be 8000 key depressions. For more Educational Qualification details visit Chhattisgarh Official Notification. Minimum and maximum Age Limits for CG Forest Computer Operator Posts is 18 years and 35 years as on 01-01-2017. Upper Age Relaxation is applicable as per Chhattisgarh Government Rules. Candidate applying for these Jobs will get monthly pay scale of Rs.13, 776/-. 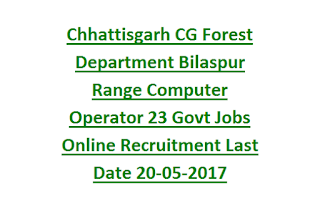 Chhattisgarh Forest Department will organize Skill Test and Interview to select candidates for the given Vacancies of Compute Operator. Applicants refer Department website for Syllabus, Exam Pattern and Date of Examination of Skill test. For written test questions will be given from Computer Knowledge, Usage of Computers.